8,510 grt; 12,399 dwt; 2 passengers. Operator: Sin Chiao Shipping Pte Ltd, Singapore. Flag: Singapore. Built: 1957 by Swan Hunter & Wigham Richardson Ltd, Wallsend, UK. Yard no 1938. Main engine: five-cylinder, two-stroke, opposed-piston Swan Hunter-Doxford 67LBD5 of 5,600 bhp at 115 rpm. Speed: 15 knots. 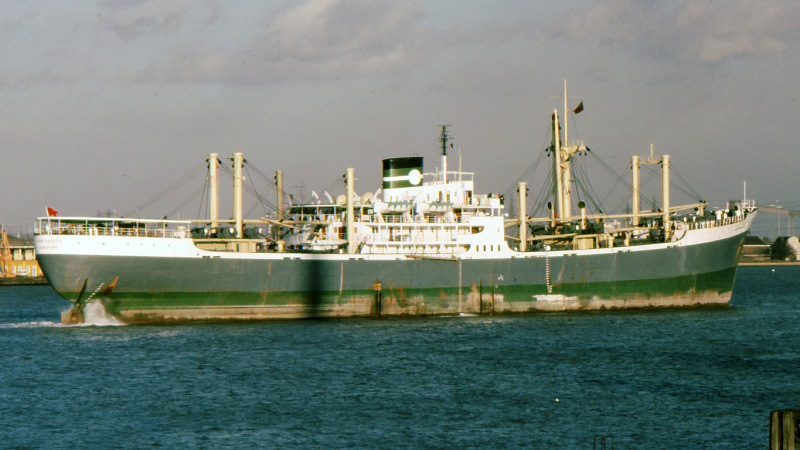 Built for Palm Line Ltd as KATSINA PALM; 1978-NEW DRAGON (as photo). 1984-to breakers at Shanghai,China 27/8. Photo: departing Tilbury Dock, London just after the change of ownership. This photo has been shown 374 times since it was added to the site.